Clay's Choice is a simple, but effective quilt block. It is comprised of only half square triangles and squares. Being a four patch quilt block, it is made up of several patches to make four quadrants. These quadrants are then sewn together to make the completed block. 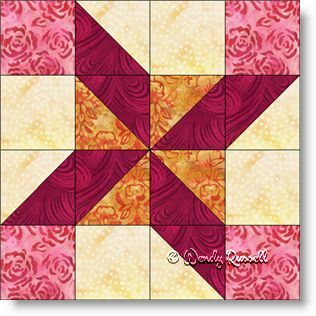 Many variations can be made of this quilt block by simply changing up the placement of the colour patches and their values. The two sample quilts shown are quilt different, but use all the same components. The quilt blocks are separated by sashing in both cases, but the difference lies in whether the blocks are laid out side by side, or on point.